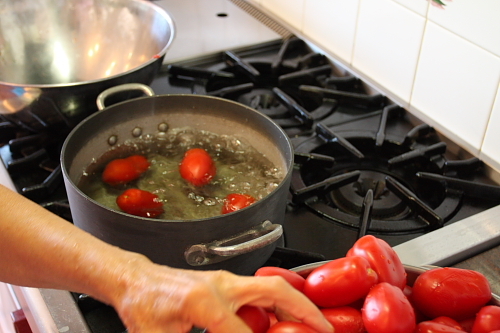 The detailed recipe for canning tomatoes will appear in my upcoming book, My Calabria, but I think you will get a good idea of what is involved by just looking at all the photos below. We picked over 100 pounds of tomatoes in the first harvest and ended up canning 32 jars, not counting the tomatoes I brought to my cooking class. It takes on average 2.5 to 3 pounds of tomatoes to fill a quart jar. The canning took only three hours, with my husband, my son, and my mother all helping out. Cleanliness is extremely important when canning. The first step is to clean the tomatoes well and make sure your jars are also clean. Once packed and sealed the jars go in a water bath, where they are boiled for one hour. Here is the finished product to be put away for the winter months, so that throughout the year we can enjoy the taste of fresh tomatoes. There is nothing like it! Since last week, I have picked even more tomatoes in a second harvest and will be canning about 25 more jars tomorrow.